A Friday afternoon, right before a weekend, is not an easy time to keep a classroom full of 20 college freshman focused on their work. Everyone is thinking about their plans and not the practice run of their case study presentations. Even with this working against him, Professor Richard Bath kept room 314 of Donahue laughing, smiling, focused on their work. It is a testimony to Bath’s talent as a teacher not only to keep this class on track and in such high spirits, but also to his experience and time at Lasell. Bath has been a professor at Lasell College for 27 years and was the Fashion Department chair for 21 years from 1988 to 2009. But in August 1988, Donahue was just a barn, Lasell was a junior college, and Bath was applying to a job found in the paper seeking a fashion department head. “I thought if I could get in the room and talk about my experience, I might have a shot,” said Bath. The seven people involved in the first interview were impressed with his degree from the University of Westminster in London, England, his internships with Harrods, Selfridges, and his experience in corporate retail. That night, he was called to schedule a second interview, this time with the president of the college, Tom DeWitt. The night of the second interview, which lasted three and a half hours, Bath was at home, eating dinner with his family, when he received a call from the Vice President of Student Affairs, offering him the position. Bath accepted the job before hearing any details of a contract or salary. “Given the feeling I had about this institution and fact I had a pretty good background and they were offering me this position only after three days, I felt they were going to be fair in the salary,” said Bath. 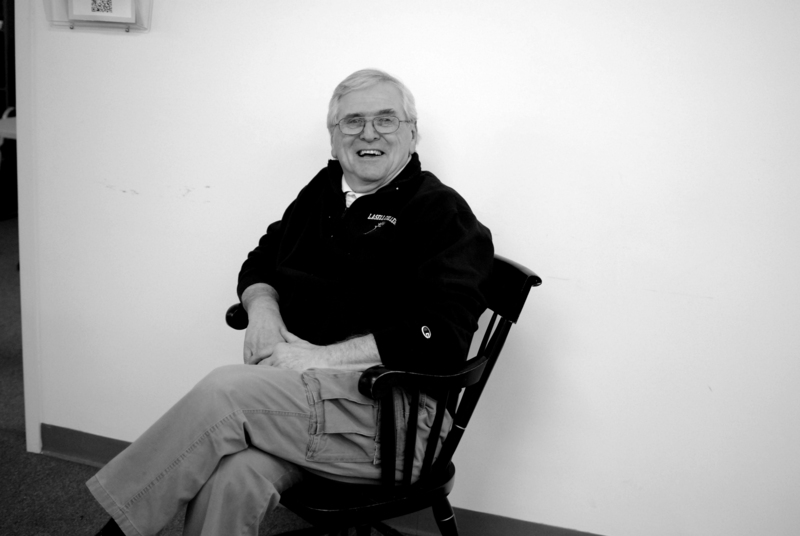 He spent most of his first year at Lasell listening to the students. Ostrow said Bath has always ensured that students feel important and like professionals. After taking time to listen to what the students and faculty wanted, Bath compiled information and started making changes, first, with the curriculum. He met with all of his industry contacts and spent an entire day writing the bachelor’s degree for fashion merchandising. “Everybody that he has hired worked in the industry,” said Professor Maritza Farrell. When the time came for a visiting team to review the degree, a requirement to move from an associates to a bachelors, Bath wanted the best. “If we were going to get a bachelor’s degree in fashion merchandising, then we needed the endorsement of the best college on the planet,” said Bath. The Fashion Institute of Technology representative approved the degree without any recommendation or suggestion for changes and the fashion department had its first bachelor degree. “That’s how it started,” said Bath. Next was the fashion design degree, which struck inspiration with Bath after a trip with 40 students and faculty to a sister school in Montreal. Sitting on a bus to Lasell, Bath started jotting down notes and a course structure. As he did with the merchandising degree, Bath reviewed the curriculum with his contacts in the industry and soon it was passed. The fashion department was growing. With $45,000 Bath created the first fashion design lab in Wolfe Hall, with only three students to teach. Then, Bath requested to change the name of the department to the Lasell Institute for Fashion Technology and to be moved to Yamawaki Arts and Culture Center. “He has always been a proponent of innovation,” said Ostrow. With just those small changes, enrollment in the department skyrocketed, growing so big the school needed more technology and equipment. At this time, Bath’s negotiation and retail skills came to aid and got the department 12 stations, licenses, and software called Computer Aided Design, worth $10,000 a piece, for free. “He has a lot of experience and a lot of people look up to him,” said son Jonathan Bath, senior criminal justice major. Having built the Fashion Department up from one associate to two bachelor degrees, renaming and locating the department, winning prestigious design competitions, Bath still felt that something was missing. While driving up route 128 in the fall of 2000, Bath decided Lasell needed a magazine. Polished was created by himself and six young women, still remembered by a framed picture he keeps in his office. The student written and produced magazine won the gold certificate in the Columbia Scholastic Press Association Gold Circle Award in 2006. It was in 2009 when Bath stepped down as head of the department and started teaching full time. “I really wanted to devote all of my time to teaching,” said Bath, who taught four courses every year as department head, though he was entitled to a two course drop. After creating the Fashion Department known by students today, Bath still credits its success to the faculty. “I hire people who are smarter than me and let them go to work.” said Bath. He said hiring Lynn Blake, current fashion department head, was one of the smartest decisions he ever made. In addition to the incredible staff, Bath said the students are what makes this program successful. “We as a faculty are very fortunate in that we work with a bunch of students who get, understand, and are dedicated to the industry,” said Bath. In 27 years Bath created a department that draws students to this school from all around the country. He put the Lasell fashion department on the map and made this college what it is today. He continues his work in the classroom, shaping the young minds of the fashion industry.